It dawned on me after I posted the previous installment of this series that I failed to write a pithy introduction. My apologies. It is difficult when one takes into consideration that by the time I’m finished with this project I will have written about 20 such intros. What makes it even harder is that my taste in movies tends to be so eclectic, something that is really being driven home to me as I write these little ditties, that usually there’s nothing to tie any 5 of these movies together. Today’s entry is a perfect example. There are virtually no similarities between any of these five films. I suppose the good thing is that with such a wide variety of things that I like I am bound to touch on atleast one thing or another that’ll be of interest to everyone. 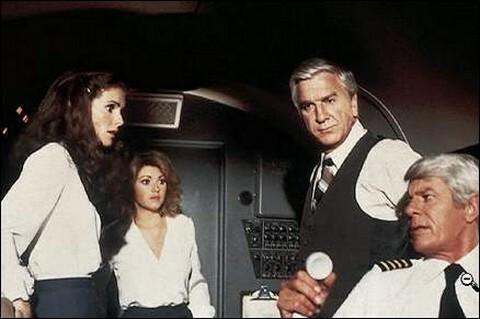 If anyone were ever to build a Mount Rushmore of parody films, the first and foremost honoree would have to be Airplane!. Made in 1980, the film is meant to spoof a plethora of 70’s airline disaster flicks. It’s cast is a brilliant collection of heretofore tough guy types known for their dramatic roles, most notably Robert Stack, Leslie Nielsen, Loyd Bridges, and Peter Graves, who are very much cast against type. Kareem Abdul-Jabbar makes a super fun cameo as himself apparently trying to live a double life as an airline pilot under an assumed name. The plot involves many of the passengers and nearly the entire crew, including the pilot and co-pilot, becoming ill because of food poisoning and a passenger who just happens to be a pilot with post traumatic stress disorder being called into action to fly and land the plane. But this is another rare case where the story takes a back seat. This time though the centerpiece of hilarity are sight gags and side-splitting word play. One has to watch Airplane! a few times to take in all the visual and verbal gags. There’s Barbara Billingsley, the mother on Leave It to Beaver, speaking ebonics. The emergency autopilot is a blowup doll. A guy who thinks he’s Ethel Merman (played, in her final appearance on film, by Ethel Merman). Co-pilots named Roger and Captain Oveur (think about it). And the great thing is, it never gets old. After over a quarter century those of us who love this movie still laugh when we watch. Robert Deniro is such a brilliant actor that he could take the worst story imaginable and make it halfway compelling. Fortunately as real life boxer Jake Lamotta, in a film directed by the legendary Martin Scorcese, Deniro has a good story with which to work. He also has capable support from Joe Pesci in what was his first major film. I’m not a big boxing fan, but the acting and Scorcese’s style make this a modern classic. Maybe if I’d have been born a few years earlier or if I loved boxing as much as I do other sports Raging Bull would rank higher, as it does on most lists of this ilk. However, I must remain true to my own tastes and preferences, and this is where it falls on my spectrum. Readers of this series know by now of my affection for Jimmy Stewart. I’m also a bit of a political aficionado and an unabashed patriot, so Mr. Smith falls right into my wheelhouse. The story revolves around a small town yokel (a role Stewart showed many times he could play perfectly) who is handpicked to fill an open seat in the U.S. Senate. He is chosen by a corrupt political machine who believes he can be easily manipulated so they can achieve their selfish goals. The villain in this complex web of deceit is the elder senator from Stewart’s state, played by Claud Rains, who is probably better known for playing the corrupt police official in Casablanca. Rains played the role of conflicted slimeball several times and was apparently quite good at it. I’m not sure how a Frenchman snagged the role of a United States Senator, and the fact that he doesn’t really make much of an effort to hide the accent is somewhat distracting. Adding support as a caustic adminstrative aide is Jean Arthur. She is assigned the task of babysitting the doe-eyed new Senator and gradually falls for him. The plotline specifics, in which Stewart’s character wants to build a “national boys’ camp” on land that, unbeknownst to him, Rains’ character has more nefarious and profitable plans in store, are not necessarily all that crucial. The film is about political corruption, and in its time it was groundbreaking. We’ve become a much more cynical nation now. But 70 years ago a movie that took such a dark view of the inner workings of our government was quite controversial. Stewart’s performance show’s his range. Over the course of his career, from lighthearted comedies like Harvey and The Philadelphia Story through Hitchcockian fare such as Vertigo and Rear Window to hardscrabble westerns including Shenandoah and The Rare Breed Stewart did a bit of everything and proved himself to be a fine actor. 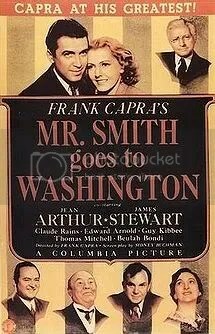 With Mr. Smith he gives a small sampling of that range within one movie, goofy and fun in some scenes and dark and solemn in others. Because of the access the masses now have through things like CSPAN, the internet, and talk radio there’s not a whole lot that goes on in Washington DC that’s unknown or all that shocking. To some degree that hurts the legacy of Mr. Smith because we don’t see what the big deal is outside of Stewart’s winning charm. However, taken within the context of its time it’s quite a cinematic achievement. DeNiro makes a second appearance in today’s group, so I guess I was wrong…there is a common thread after all. This time however, he’s doing comedy…and doing it surprisingly well. Meet the Parents stars Ben Stiller as a male nurse who goes home for the weekend with his girlfriend (who he is planning to make his fiancee) to…you guessed it…meet her parents. Unfortunately for Stiller, things get off on the wrong foot and get worse from there. Hilarity ensues. This is one of those movies that has more than its fair share of memorable scenes and lines, which is its main charm. Stiller has never been funnier in my opinion, and Owen Wilson has an hysterical cameo as the girlfriend’s former boyfriend. After watching this film water volleyball, Puff the Magic Dragon, airports, and cats can never be thought of like they were before…trust me. A sequel was made a few years later called Meet the Fockers. It was okay, but as with most sequels it failed to rise to the high level of the original. Is it a horror film?? I suppose. I’m not necessarily sure how the experts categorize it. If it is officially a horror film it is most certainly on the high end…..sort of like how Dom Perrignon and Andre Extra Dry are both technically champagne but one is $150/bottle and the other is available at 7/11. Silence of the Lambs is based on a really great book about a young FBI agent who enlists the aid of a jailed, psychotic cannibal to track down a fellow serial killer. 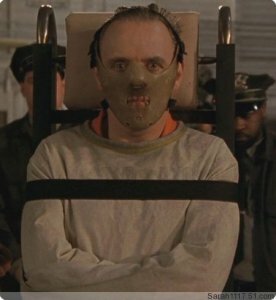 The psychotic cannibal is Hannibal “The Cannibal” Lechter and he is one of the creepiest yet most sublime creations in cinematic history as portrayed by Sir Anthony Hopkins. Unlike most maniacal killers in stereotypical gorefests (think Jason from Friday the 13th, Leatherface from Texas Chainsaw Massacre, or Freddy Krueger from Nightmare on Elm Street), Hannibal doesn’t need knives or chainsaws, doesn’t wear a mask, and doesn’t have any kind of otherworldly nonsensical powers. He’s actually pretty realistic…almost like a normal person you or I may know, may work with, or who might live down the street…except for the fact that he likes to eat humans. Jodie Foster is fantastic as Clarice Starling, the agent who looks to be in way over her head. The whodunit part of the movie is secondary to the interactions involving Hannibal and Clarice, but it’s also what separates Silence of the Lambs from the rest of the cliched mass of blood-n-guts. Sure there is some violence, but there is also a compelling story and extraordinary performances. I won’t go so far as to say the movie is better than the book, but let’s call it a tie. I can see you might be an expert at your field! I am launching a website soon, and your info is going to be quite useful for me.. Thanks for all your assist and wishing you all the success. A friend I work with looks at your page repeatedly and recommended it to me to read also. Thanks for the insight you offer the visitors!